Not every dream home is a 2,20-square-foot mansion. For some, the dream home comes in a tiny space that can be moved from place to place and has no debt or mortgage associated with it. Brandon's and Hannah's dream had a slightly different twist. 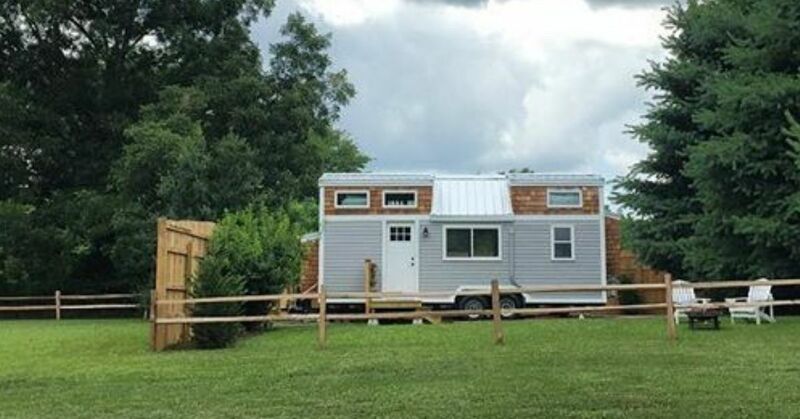 They wanted to build a tiny home and use it as an Airbnb. They began building their home in November 2017, and today, The Haven has an elegant spiral staircase and sits at their place in Tennessee, waiting for guests to arrive. When visitors enter through the front door, they are welcomed by the cozy sitting room. Past the "family room" is the kitchen with a stainless steal sink, full-sized refrigerator and freezer, and built-in coffee nook at the window. The ladder on the wall leads up to a loft where two can sleep. A gorgeous circular staircase at the opposite end of the sitting room leads to a second loft for more sleepers. The barn door hides the entry to the bathroom. The second loft is made up for only one person, but the space could easily hold a double mattress. The white walls, complimented by the dark floors, rails and chandelier, keep this tiny haven from feeling tiny. The bathroom sports a pedestal sink and hooks to hang towels. Extra storage for clean towels and linens is in the closet, and hangers await the clothes of those who come for a stay. All in all, Brandon's and Hannah's tiny haven provides a cozy haven for those who need a respite from the toils of life.